We have won various awards over the years for both our innovative waste management programs as well as our education campaigns that encourage people to recycle right. We are proud that Lismore's progressive approach to waste management is recognised and we are equally proud of our community, whose excellent recycling habits are the real reason for our success. We are only as good as our recyclers at home! Below is a list of awards and recognition we have received to date. 2014: The ‘Dirty Dozen’ recycling education campaign won a Local Government NSW Excellence in the Environment Award. 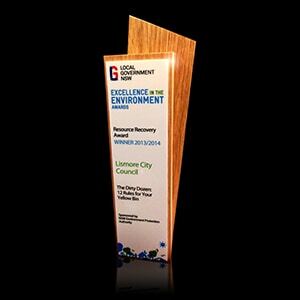 2013: Local Government Management Excellence Awards ‘Highly Commended’ in the category of Excellence in Environmental Leadership and Sustainability for several projects including the MRF, phytocapping, our solar initiatives and our new electric car. 2012: Bronze award at the Local Government Innovation in Waste Awards for Resource Recovery Collection Stations. 2011: Winner of the Local Government Awards ‘Working with Schools Award’ for the Mobile Muster Program. 2001-2002: Join winner of the NSW Local Government Excellence in the Environment Awards for the ‘Do the Right Bin’ campaign. 2008: ‘Highly Commended’ in the IPWEA Engineering Excellence Awards for the Three Rs – Recovering Recycling and Reusing. 2008: National Excellence Award at the Local Government Awards for the Mobile Muster Program. 2008: Winner of the ‘Community Engagement’ category in the NSW Sustainable Water Challenge for the ‘Let’s Make Every Drop Count’ Education Program. 1999: Winner of the Waste Management Award at the Local Government Excellence in the Environment Awards for ‘Working towards a low waste future’.